When, in 1968, President Kenneth Kaunda of Zambia appealed to the Churches to become more actively involved in solving the social problems Zambia was facing, the Anglican Church through Archbishop Oliver Green-Wilkinson responded by allowing one of its priests, Fr Pierre Dil, to go into development work full-time. The decision means a move from the Lusaka Cathedral to Makeni for the Dil Family in December, 1968. Initially Fr Dil’s activities were mostly in the area of nutrition, since malnutrition and child mortality constituted Zambia’s most pressing problems. It resulted in the setting up of the Lusaka Nutrition Group, which soon sustained over one hundred nutrition centres, supported by nearly 200 volunteers. Over the years it became clear that malnutrition had, among its many causes, two major causes: (i) poor township people had no access to land to grow food; (ii) they lacked agricultural and related skills. The Dil family acquired a house in the Makeni area, since the Church does not supply housing to “worker priests.” With the house came 10 acres of bush land. After some months of life in Makeni, and as we got to know local people, they conveyed to us their concerns and needs for educational and community services. It led to a decision to try to set up a Makeni community centre. The vision was to put Christ’s love for man in action, combining Christian witness and community services. The Dil Family decided to donate five acres of land (the legal limit) to Makeni Ecumenical Centre (MEC) which was set up as a registered charitable Company limited by Guarantee. A “Deed of Gift” legalised the grant of land. N.O.V.I.B., of the Netherlands, were the first to grant funds to MEC, followed, shortly afterwards by Algemeen Diakonaal Bureau of the Reformed Churches in The Netherlands. 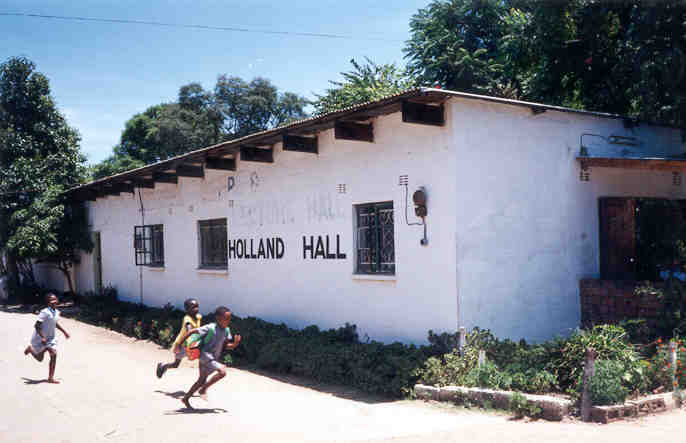 Four buildings went up in 1971: the “Holland Hall”, the “Zambia Hall”, a nutrition centre and a clinic. A Primary School began and classes in nutrition, home craft, and agriculture commenced. In 1975, an Afrikaner farmer donated ten acres of land to MEC, adjoining the existing plot. It proved an invaluable gift, enabling agricultural students to do vegetable and crop cultivation. Family Planning, Agricultural Training and the creation of agricultural settlement villages have always been MEC’s main social focus. It has so far created five new villages, varying from 45-110 kilometres from Lusaka. The potential population of these villages is about 580 families or some 3500 people on 6045 acres. Family planning services have been extended to these villages and to neighbouring areas. As part of the vision for MEC, Christian witness has grown alongside our social and community work. There are now five congregations in the Centre, two in Kafue Settlement Village, five in Mwembeshi SV, two at Kalwelwe SV, two at Chisamba SV and one in Mwomboshi (total 17).